This post is going to be very difficult to write, but I feel like it’s something I need to do. 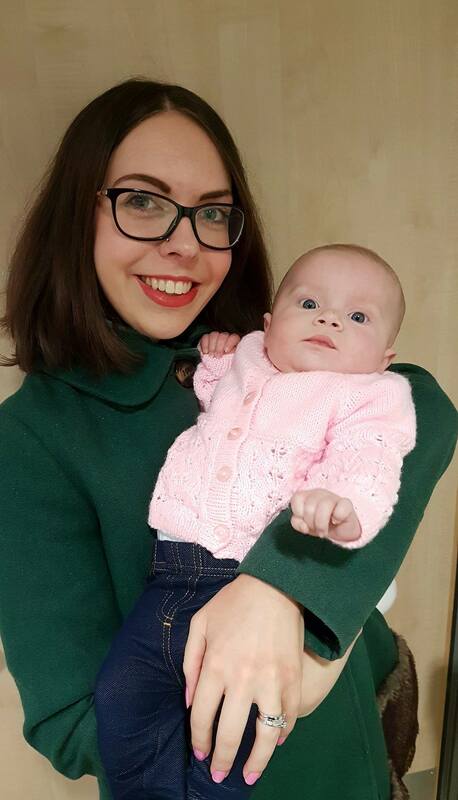 I have written a short version of this story as a guest post for Rachel Bustin‘s New Mums Series about how it’s never too early to trust your instincts as a mum, but I’m going to go into more detail here. To begin with, repeating this story felt like it hurt me deeper and deeper each time. However, I’ve now had to repeat it so many times that I think it’s now getting easier each time and possibly helping me to heal and come to terms with what happened. Perhaps one day, someone else will read this who is going through the same or a similar situation (thankfully, this is EXTREMELY rare) and can live in hope knowing it gets better. Autumn was two weeks old near the beginning of October 2016. Dave had gone into town and I remember sitting in bed breastfeeding Autumn, gazing down at her feeling so proud and in love, feeling like she was almost too good to be true. That evening, I was breastfeeding her while watching TV. Suddenly, as soon as she’d finished feeding (I hadn’t even had time to put her on my shoulder to burp her), she projectile vomited. “Ooh, someone was greedy!” I said, but already, something in my mind was telling me perhaps something wasn’t quite right. She’d looked shocked and it was projectile, unlike when babies are sick normally. The next feed around midnight, the same thing happened and she threw up everywhere again. The same happened with the next feed around 3am and the next around 6am. By now I absolutely knew something wasn’t right and I as soon as the doctors opened, I made an appointment to go and see our GP. We didn’t see him until about 11am and when he did his checks everything seemed fine – her temperature was ok, her breathing was fine and her tummy felt soft. He told us to just continue monitoring her, keep her hydrated and call 111 if we got concerned and said that maybe she just had some sort of bug. Within an hour of being home, she was hungry so I breastfed her again. She threw that up and it was slightly yellow in colour; I panicked slightly and called 111. Within 15 minutes, paramedics were at our home and checking her out. They did the same checks as the doctor and told us they were fine. However, they did speak to the doctor and made another appointment for us to see him around 5pm. At 4.30pm, we thought we’d change Autumn’s nappy before we went to see the doctor. Unusually for her at that age, she’d just had wet nappies all day, but this one was a dirty one. Its contents were foul smelling, black and liquid. Something was clearly very wrong. I took a photo of it on my phone to show the doctor. When he called us through, he did the same checks as before and said everything seemed fine. Then I showed him the picture of her nappy. His expression changed and he told us to sit in the waiting room for a few minutes. When he came into the waiting room he was holding a letter; he’d been on the telephone to the local hospital and spoken to one of their paediatric doctors who asked us to come straight in. When we got there, we had to sit in a room for ages before we got given a room to sit in. Autumn was screaming because she was hungry, but I didn’t know what tests they were going to have to do or if I was allowed to feed her. In the end, she was crying so much that I got Dave to pull the blinds down in the room and I breastfed her. A doctor came in after a little while and spoke to us, I’m not sure what exactly it was all about now, everything that happened afterwards has blurred it in my memory. One thing I know was that they wanted to have a measurement of what she was being fed, so I had to express, which I’d never done before. A lovely nurse brought a pump in and showed me what to do. As Autumn had been barely feeding all day, it was a great relief and I managed to fill an entire bottle, which impressed one of the nurses. When Autumn was hungry next, we were waiting to see another doctor, so we went out and asked the nurses at the desk whether we were allowed to feed her. We were, so we got the bottle of milk and tried to feed her. She didn’t want to take the bottle, we both tried. So we got another nurse, who was lovely, and she sat with Autumn and got her to drink it all. “See, it just takes a little persuasion”, she said. She didn’t throw it up straight away and the nurse left the room. No sooner had she got to the desk, Autumn threw it all straight back up over Dave. Autumn had to have a lumbar puncture and other tests and I could hear her screaming down the corridor. It was one of the most awful things I’ve ever heard. I was just laying on the bed on my side in a high state of anxiety, crying and praying that I was going to wake up and it was all just going to be a bad dream. “Was she full term?” people kept asking. “Yes, she was”, I replied, “she’s been perfectly healthy and everyone’s been perfectly happy with her until now”. She was kept under close watch over night and initially not allowed to eat anything. She was crying because she was hungry, so they gave her a pink dummy which she became very attached to. However, by the following morning they had started giving her small feeds which she was managing to keep down without bringing it back up, although her nappies were just the same. They were happy enough for her to move into the normal children’s ward, saying perhaps it was just a bug that she had. Later that day she had an ultrasound which found that she had a mass just above her right hip that was about 4.5cm squared. They didn’t know what it was attached to, what it was filled with (gas or air), or if it was significant to her being unwell – the only thing they could reassure us about was that it wasn’t cancer. They’d be doing a further scan on Monday, but as it was the weekend nobody could do it that day. We continued with me expressing milk and her having small amounts of it without vomiting, but still having awful nappies until the following afternoon. I noticed that she’d been making grunting noises for about 5 minutes. “Maybe she’s just straining to do a poo”, my husband says, “she does that”. “I know, but this has been going on continually for 5 minutes – it’s every breath, listen”, I replied. My instincts were screaming at me that something was wrong. I asked, no, demanded, that my husband go and get the nurse. She came in and listened to it. “Hmm…okay, I’m just going to go and get a doctor”, she said. When the doctor came in, he listened and found that her temperature was high, her heart rate was high, her oxygenation levels were lower than they should be – basically she had a temperature and was struggling to breathe. I knew my instincts were right! 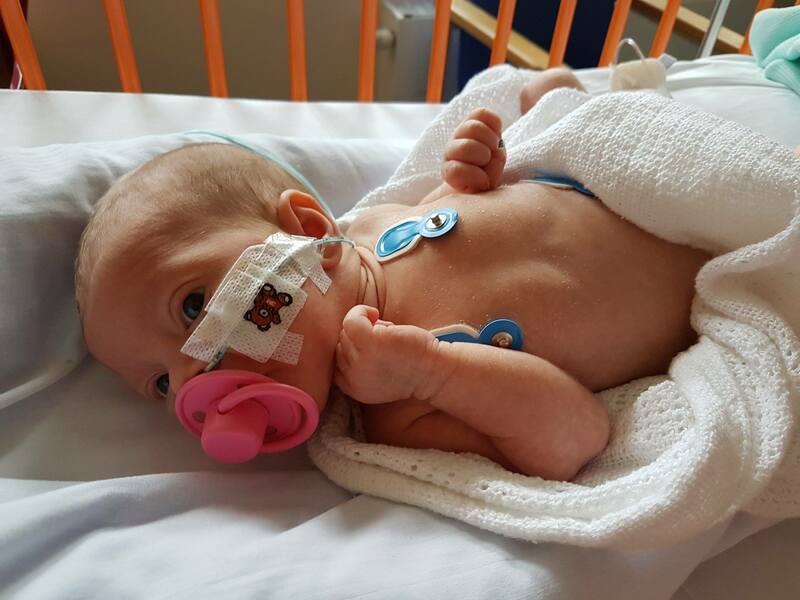 Autumn was moved back to intensive care, where she was monitored and they continued with the antibiotics and anti-reflux treatment they’d been using since the day before. That night, things were no better, so we were told we were going to be transferred to a hospital in London. I hated seeing her on that stretcher, I felt so helpless watching her. I kissed her little head, knowing she was so ill, worrying that it was the last time I was going to see her little eyes looking back up at me, her Mummy. We watched the ambulance go off in the distance, blue lights flashing. We got stuck in traffic on the way to the hospital and when we got to the paediatric intensive care unit there, it was during the morning switch-over. I slumped on the floor, helpless, not knowing what was going on. A kind lady helped us over to the parents’ quarters and then called us into where Autumn was to meet our nurse for the day. Autumn was doing much better – she hadn’t been struggling to breathe since somewhere between hospitals, although her temperature was still high. They did further scans and confirmed the same things, also unable to tell us of any significance. I hated seeing the cannulas in her hands and feet, they kept having to redo it, making her scream in pain each time as she kept wiggling the feet ones out. Eventually, they just couldn’t use any of the veins in her hands or feet and had to use a vein in her head. They asked for my permission. I said yes, I had to of course. It had to be done to help her get better, but I felt awful. After hearing her screaming after the cannulas in the first hospital, I made sure I kept well away for these cannulas being done – and the second lumbar puncture they did. Over the next couple of days, Autumn’s nappies went back to normal and she was able to start taking feeds directly from me again. We were transferred onto a normal children’s ward for a couple of days while they did more scans and got results. They said they didn’t want to operate on a baby so small, which I completely understood. There was still confusion over whether the cyst had made her ill or whether it was just a coincidence that it was found and the illness had just been some strange virus. We were discharged but invited back for another scan two weeks later. When the sonographer started doing her ultrasound, I was watching the screen as he looked at things. He looked puzzled when he was scanning above her right hip. Then he scanned over to the left – and there it was, on the opposite side. I was confused too. I looked at that cyst on the screen with such anger. “You evil, horrible, nasty thing”, I thought, “how dare you be inside my beautiful baby girl”. We spent the weekend not knowing whether we were going to be going in on Monday for surgery or not – it depended on the results of the scan whether they wanted to operate then or leave it until she was bigger. 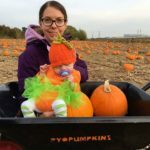 On the Sunday, we had a lovely afternoon picking pumpkins with my parents at the pick your own pumpkin farm with Autumn dressed as a little pumpkin, (she looked so cute! ), but when we got home there was a message on the answering machine asking us to call the hospital. Dave spoke to the doctor, they did want to operate on her the next day. The next morning, we packed our bags and went. The poor little thing was grumpy as she was hungry – she wasn’t allowed to have milk any later than 7.30am and we had to give her water to keep her well hydrated before her operation in the afternoon. They still didn’t know what it was attached to and told us that if it was attached to her bowel the recovery would be a lot longer. All sorts of awful things could happen and in cutting it from the side of the bowel they would have to repair the hole they’d made in the bowel. If it was attached to an ovary it be better. They told us they’d have to do keyhole surgery to have a look around first and depending on what they found they may be able to do keyhole surgery or it may have to be open surgery. When it was time for the operation, we went into the room with her. I held her hand as they put the mask on her to anaesthetise her and felt awful as she cried – I think she was scared and didn’t like the smell of it. After we left the theatre so that they could investigate and start operating, I felt helpless, I didn’t know what to do and time seemed to move so slowly. I just constantly wondered what was happening. After what seemed like forever, the buzzer finally went and we could go to see her back in the paediatric intensive care unit. She was on morphine and sucking a dummy that had cherry flavoured sugar syrup on it and seemed dozy but fairly content when we arrived. We gave her some milk and she drank it, not much, but some. She seemed more concerned with sleeping. A doctor came over to give us a quick overview before we saw the surgical consultant with more information. “They removed the ovary”, she started. “WHAT? !” I thought, “they’ve taken out one of my little girl’s ovaries? !” All sorts of things ran through my mind…”Why? I wish you’d asked my permission first! Is she going to have periods every other month? Is this going to have an effect on her fertility?” A mother shouldn’t have to worry about her daughter’s fertility at 5 weeks old, but there I was. Fortunately, it shouldn’t have any effect on any of this. It turned out that the cyst had been mobile, which was why it had moved sides between scans. It was so mobile in fact, that they’d watched it move from side to side just by pressing on her tummy. It had wrapped itself around one of the ovaries and killed it off – that’s why they had to remove one of her ovaries as well as the cyst. I didn’t mind so much that they’d taken it out once I’d found out it was already dead. They now think that the cyst wrapping itself around the ovary and killing it caused a stress response within her body mimicking sepsis, which explains the symptoms she exhibited in the local hospital and the symptoms I’d noticed before our admission. Autumn recovered very well and very quickly, bearing in mind the fact she’d just had open surgery. I could barely take watching the process though. For the first day and a half she kept crying in pain. I knew it was pain. I’m her Mum, I have that instinct and I knew it was a cry I didn’t recognise as needing a nappy change or milk. Sometimes when she cried in pain, her whole little face scrunched up in agony. It was awful. We were transferred onto a normal ward once they were happy she was responding to the morphine well and happy with her heart rate and oxygenation levels. However, I kept noticing she was in pain and I got cross when she was due a dose of Calpol and they left it longer than they could have done. The first evening, I could tell she was still in pain and I had to ask the nurses if she could have morphine again. The nurse got a doctor in and they decided she could have some more morphine. She had that dose and another a few hours later in the early hours of the morning, then after that she seemed okay with just Calpol. The next afternoon we were finally allowed to go home. I am full of praise for all the doctors, nurses and surgeons who looked after Autumn. What would we do without our NHS? Yes, waiting times for scans and things are slow – but they’re under pressure and I am confident that everyone who looked after her was doing their absolute best. I am also so thankful for all the support we had from our family, friends and church. We had family visiting us almost every day we were at the hospitals, bringing us food and clothing. The curate from our church visited us at the hospital and we had a whole network of local churches praying for Autumn. Friends kept sharing us messages of love and support and asking after us all. We even received lovely gifts of cuddly toys and a card for Autumn from friends who live a couple of doors along from my parents. I have been working on a blog post talking about the severe anxiety I suffered as a result of everything that happened, but all the wonderful support we received from people is the reason Dave and I got through it as well as we did and I’m so grateful. Have you gone through a similar experience? I’d love to hear from you! This must have been hard to write, at some point I’ll eventually blog about Chase’s birth – but it’s still too difficult to do almost 7 years on, although I feel that’s likely due to the ongoing situation caused by his birth. It was difficult, but I found it somewhat therapeutic. Perhaps you’d find the same writing about Chase’s birth? Of course, we have some closure with Autumn now, so it may well be easier for me to write about than it would be for you. How awful, I’m so sorry to hear that. What was wrong with your little one? I’m glad to hear she’s doing well. 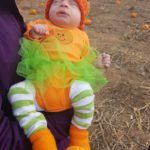 We too have been through some newborn stage scares and it is so hard on mommy. She is so beautiful momma! This must have been an amazingly hard post to write, but thank you for sharing. I am glad she is all better now. 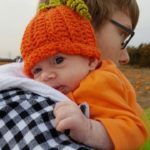 I read a similar blog post of a mothers instinct that her newborn wasn’t well, http://paleowithmrsp.com/mothers-instinct/ I was reminded of it when reading your story and thought you might like to have a look. Never stop trusting your instinct. 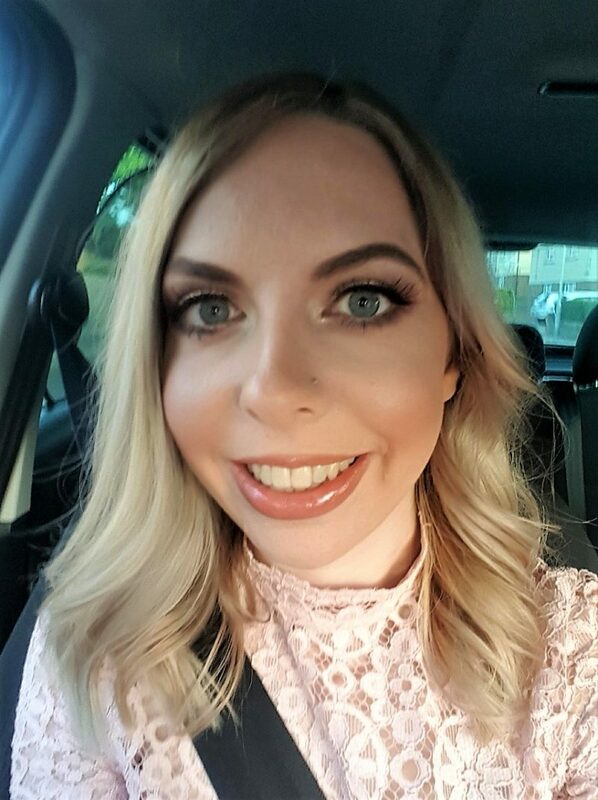 Becci – The UnNatural Mother recently posted…So What’s Your Backup Plan ? I had no idea it happened in babies. I had a ruptured cyst and dead ovary at 17. It was agony.